The Toronto Zombie Walk was pretty dead this year. 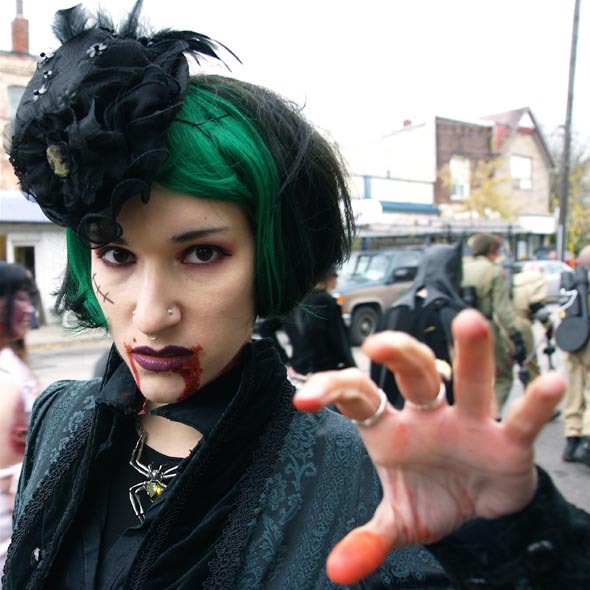 The annual pre-Halloween zombie walk, which began in 2003, continues to draw large crowds. 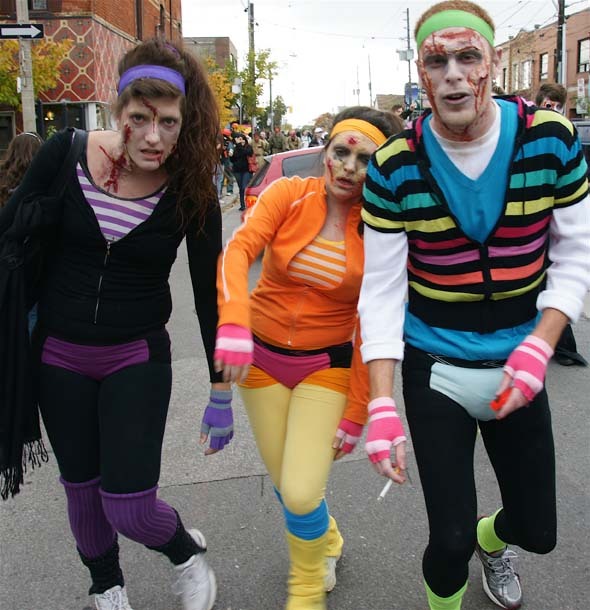 Well over 1,000 undead took to the streets on Saturday afternoon, starting at Trinity Bellwoods Park and swaggering east along Dundas St. W. to Kensington Market, up to College St. and then towards Bloor and Bathurst (where zombie films were being screened at the Bloor Cinema). 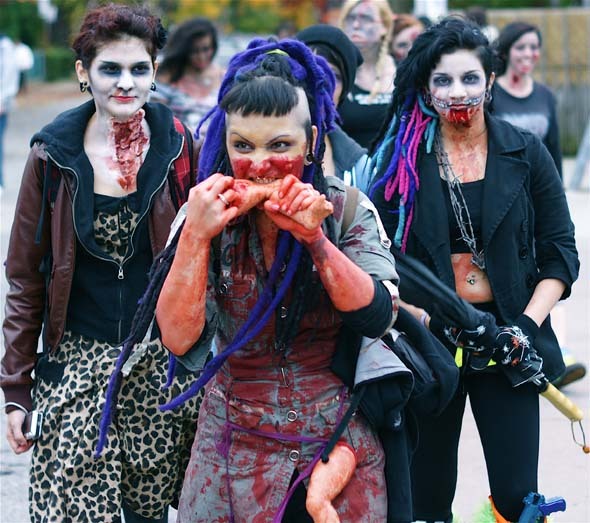 Compared to last year's zombie walk, there were more beautiful zombie brides, grooms, hockey players, Siamese twins, aerobics instructors, army officers, schoolgirls, nurses, nuns, beauty pageants, bakers, peaceniks, and Trekkies. And there were appearances by Batman and Robin, Santa Claus, Harry Potter, Beetlejuice and even a zombie Sarah Palin. 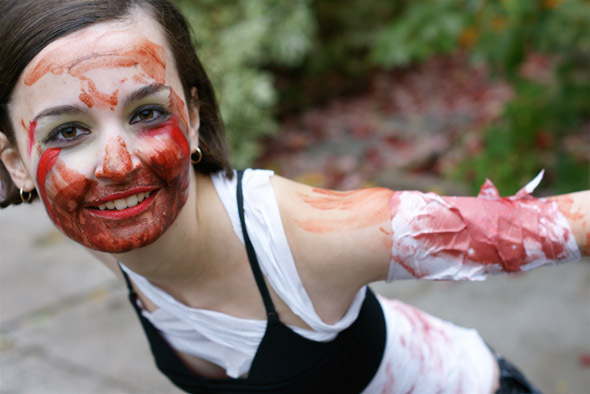 Continue reading for all the gruesome photos and an interview with Toronto Zombie Walk founder Thea Munster. When I got to Trinity Bellwoods Park, there were many more unusual creatures than the odd white squirrel scurrying about. I didn't want to get in the way of these flesh-eating girls. I was outnumbered and they looked like they meant business. I was amazed at the extent to which the zombies took pride in their appearance. 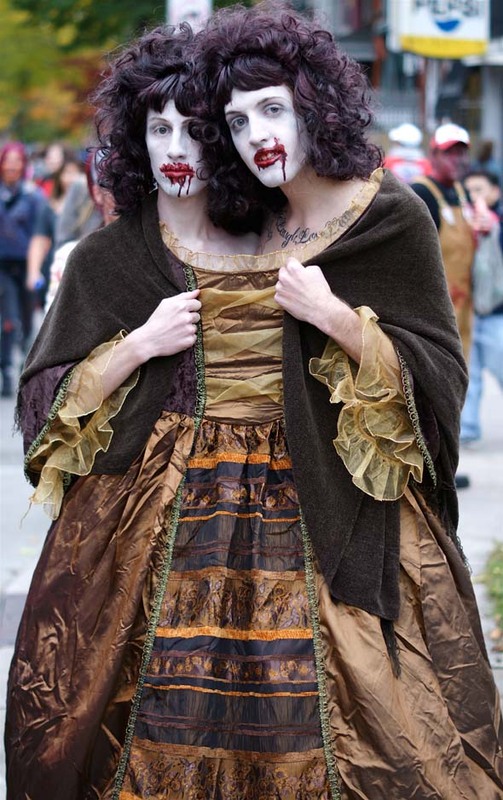 The elaborate Siamese twin zombie was really hard to tell which of the two was really male. There were plenty of eye-catching outfits, and it was a real thrill to see how animated these corpses became when found in large numbers. Some zombies were drop-dead gorgeous. It looked like this aerobic workout crew awoke from the '80s with a start. Robin seemed to have lost her Batman. And this jester didn't seem to mind filling in for The Joker. The parasol pirate zombie greeted the TTC bus with glee. It must've given those commuters something to talk about the rest of their trip. 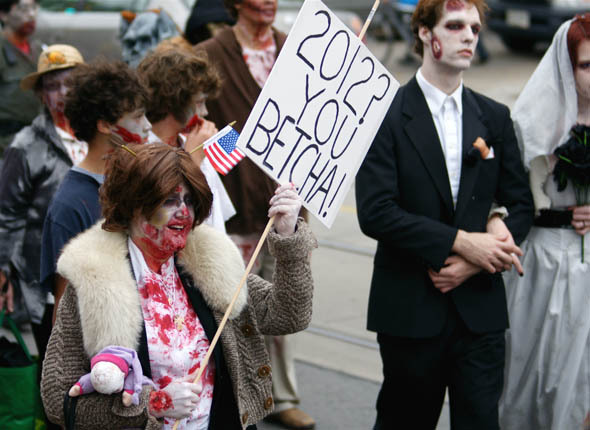 A surprise appearance by Palin made this year's Toronto Zombie Walk special. Perhaps the coolest looking dude was this peacenik hippie zombie, clearly in his element among the walking dead. The walk culminated in a dance party at the Annex WreckRoom and cinema of the dead, a screening of two zombie cult classics at The Bloor Cinema: Lucio Fulci's Zombi 2 and Night of the Comet. blogTO's Robin Sharp also got the chance to talk to Thea Munster, founder of the Toronto Zombie Walk, about all things ZombieTO. 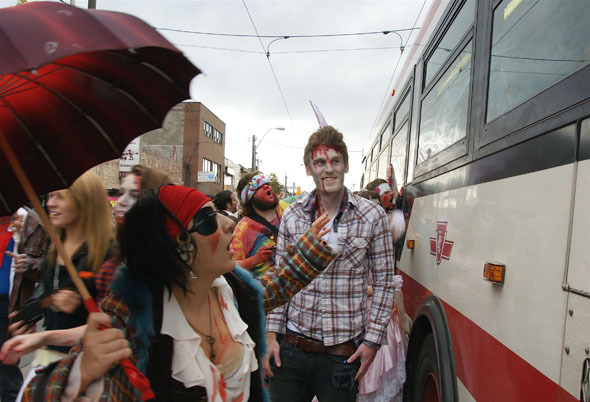 blogTO: How did the Zombie Walk get started in the first place? Thea: I believe that zombies have been gathering and walking in groups for eternity. And I am sure many groups have gotten together and roamed the streets as zombies over the last 50 years. 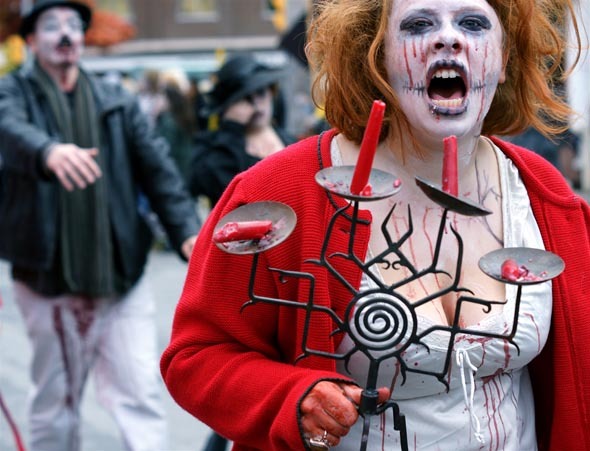 But, the first public event entitled The Zombie Walk was held in Toronto in October 2003. Not having many friends who would join me and wander the streets as zombies, I put flyers up everywhere and held the first one with a mere seven participants. One of the people on the first walk, Heather McDermitt, moved to Vancouver and started a zombie walk there. After that was San Francisco and then it spread like the plague across the globe. Have you been surprised by the growth of the event over the years? I have been astounded. I guess being a zombie is infectious! When we got 600 people out, I thought that was the height of it, but then the following year attendance was 1,200 and last year the police say they lost count at 2,500. Are there similar events going on in other cities around the world as well? 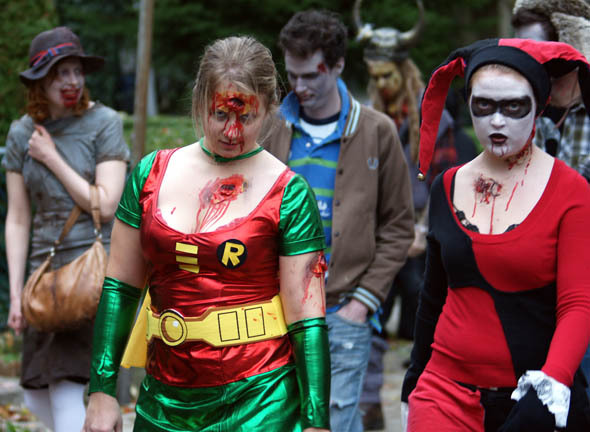 There are zombie walks all over the world now. Glasgow is holding their first one on Halloween this year. 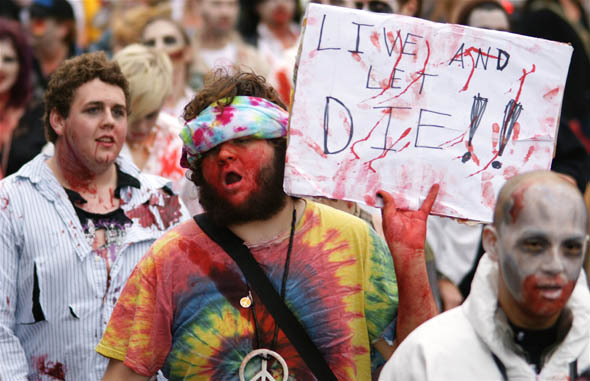 I've seen footage of zombie walks all over the United States and Canada, and even in Prague, Helsinki and Brazil. Tell me about the Zombie films that followed the walk this year? I was so excited about the zombie double feature that was put on by Cinema of the Dead. For one, it's rare to see an actual film print of a classic zombie flick. Nonetheless, two zombie film classics in one night... it was to DIE for. I think many zombies agreed: the films were great! Night of the Comet was so much fun. I say this film was in TASTYCOLOUR since valley girls are delicious to watch, especially while being terrorized by zombies. And Fulci... well, you can't go wrong with Fulci -- a true horror and gore master who always delivers thrills. What's your favourite zombie movie and why? I'm one of these people that always says "This film is my FAVORITE movie," about hundreds of different films. But as far as atmosphere, story and zombies go, I'd have to say George A. Romero's Night of the Living Dead is my very favorite zombie movie. This film scared me very badly when I was young, and after seeing it I was addicted to being scared. It's how my obsession with zombies began. And I can't really say there'd be a Toronto Zombie Walk if this movie had never existed. I also have to add Return of the Living Dead and Invisible Invaders as very close running seconds.